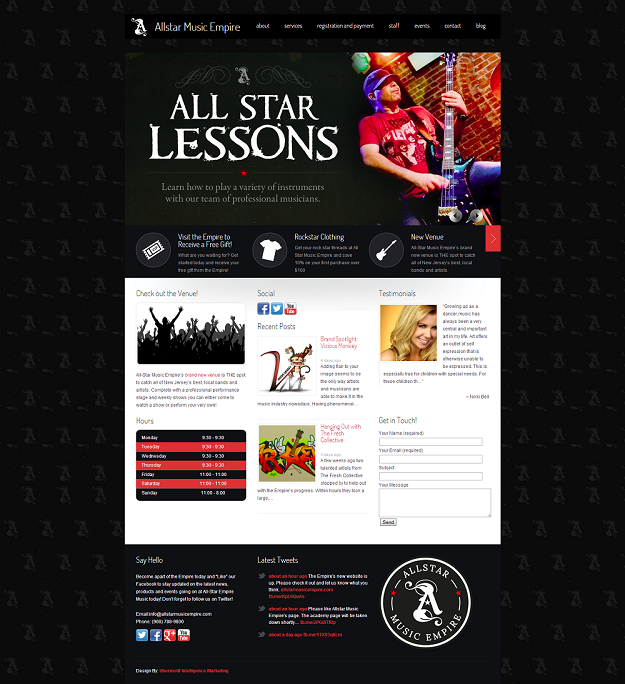 When we got the opportunity to work on a site for the All-Star Music Empire, needless to say, we jumped at the change to build a site with a rock and roll theme! Anthony G at All-Star had a vision to create a one stop shop for everything rock in the heart of central New Jersey, and we’re proud to help him make that vision a reality. From everything from music lessons, instrument sales, rock and roll clothing and a first-class venue, All-Star has it all! The site features custom logos, branding and graphics, all set on a lite responsive site that offers optimal page speed on any device! It features integrated social widgets throughout the site to keep visitors up to date with the latest news, custom events calender, trackable contact forms, and rotating testimonial widgets, all laid out with engaging content.